I love to dip my bread into sauces and dressings. If it were up to me, here I could make a full meal out of marinara sauce and a big hunk of bread. In fact, I’ve often been caught bent over a big pot of something, scooping it straight into my mouth with a piece of bread. Oops. Panzanella is a bread salad, which means that it’s basically crunchy bread soaked with dressing. Like my perfect meal. Wikipedia says that panzanella is often thought of as a “leftover salad.” This definitely applied in my case since the bread in question came from a leftover (stale) loaf of Ciabatta. 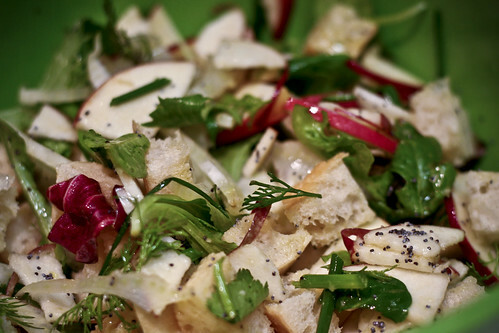 As for the vegetables, I just used whatever I had lying around — sliced fennel bulb, sliced apple, chives and some greens. I made a nice, acidic dressing with lots of white wine vinegar, Dijon mustard, olive oil and fresh garlic that soaked into the bread. The bite of the mustard was a good compliment to the sweet apples and crisp fennel. And I got to eat a big bowl of bread and still get away with calling it a salad. Preheat the broiler. Being careful not to cut yourself, slice the bread into 1/2-inch by 1/2-inch cubes. Arrange them on a cookie sheet and pop them under the broiler for a couple of minutes until the completely dry out and begin to brown slightly. Keep your eye on the bread – it burns quickly. In the meantime, whisk together the olive oil, mustard, vinegar, garlic and salt. Toss the bread with the apple, fennel, greens, chives and poppy seeds, then drizzle with the dressing and give it a good toss, making sure everything is evenly coated. Serve in a nice big bowl. Makes 4 side servings or 2 main servings. *I used an “Herb Salad” mix. You might want to add any fresh herbs you’ve got in the fridge to this as well – basil, cilantro and dill work well. That salad looks so good. I can’t wait to try this!